Reel Thunder has been exquisitely designed to not only offer attractive music and great graphics, but also to be immensely playable on a mobile device or tablet. This game brings paylines and multipliers to your fingertips with the new placement of the spin and bet buttons, for a smoother all round gaming experience. Microgaming has brought out a new slot to grace out screens, just in time for the Christmas Season. 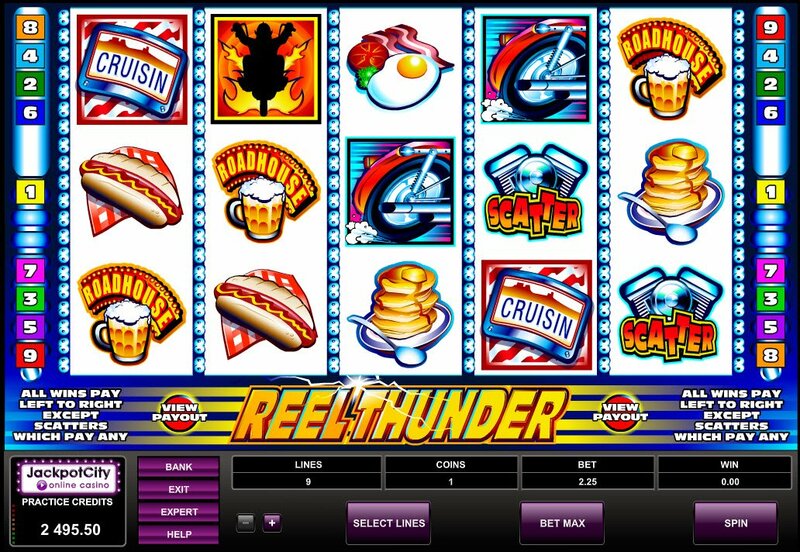 The Reel Thunder invokes images of wintery weather thundering outside, while we sit nice and cosy inside, playing our favourite Microgaming slot games. 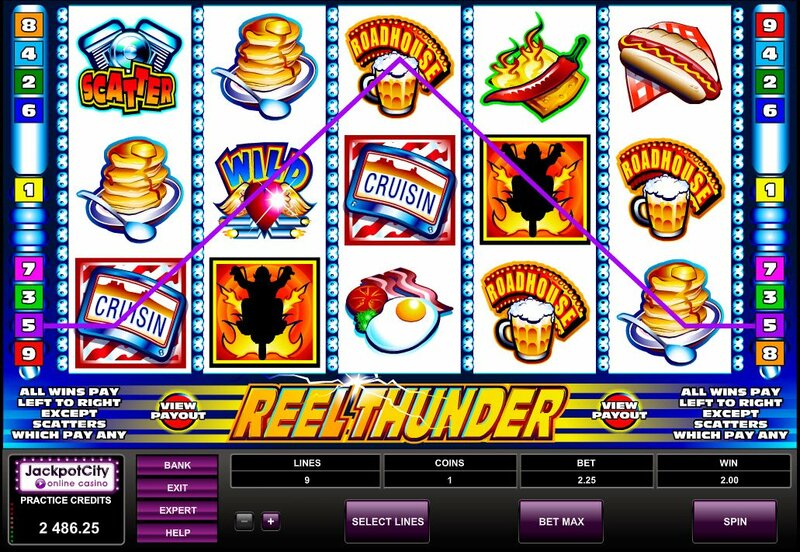 As you spin the Reel Thunder reels, music to remind you of your favourite video game will power you forward, as will all the yummy, scrumptious calories on these Microgaming reels. This is, after all, the season to be jolly and bacon, beer and pancakes slathered in syrup certainly make me jolly! Reel Thunder slot is a 9-payline, 5 reel slot game by Microgaming featuring some of their new and innovative game controls to get your engine revving in this roadhouse dining and driving extravaganza. The main notable improvement to the game control buttons is that the "Bet" and "Spin" buttons have been moved to either side of the reels, to cater for player thumb positioning. This is so we can play Microgaming's Reel Thunder slot game on our mobile devices, including tablets. A reel Christmas treat. The bet button has now become a reel, and is scrollable, allowing us to immerse ourselves almost completely into the Microgaming slot playing experience. All the roadhouse diner cuisine you can think of is accounted for here, a stack of pancakes fit for four friends, a nice plate of bacon and eggs, with a fried tomato on the side for a great one out of your 5 a day. Then there's a mustard smothered hotdog and a fiery chilli to help you drink that deliciously foamy beer down. 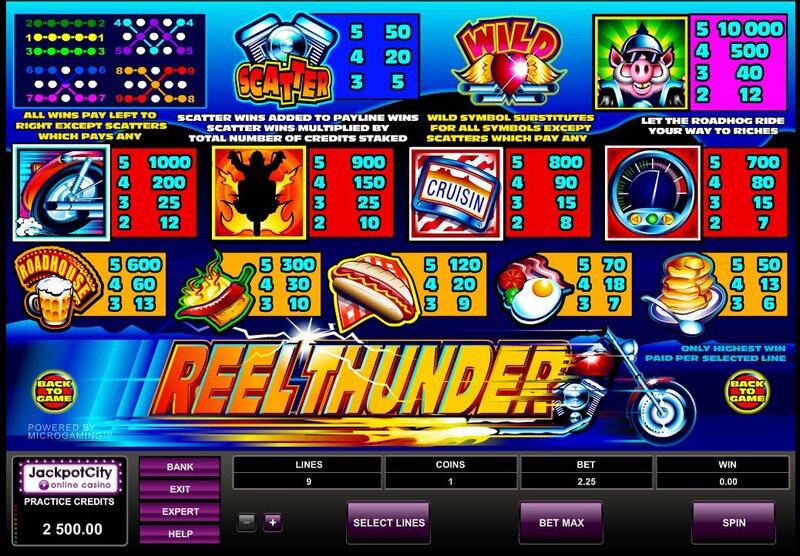 All the car driving symbols, including a silhouette of you bursting through the flames on your Harley are up, to give this Reel Thunder slot its magic. The bike headlights will have you scattering out of the way and enjoying a multiplier on those winning paylines. The wild heart with wings so it can fly down the motorway symbol will substitute for pretty much every symbol and The Roadhog is our key to riches, in full biker gear, this piggy is definitely not going to market!